On Top Of Spaghetti incorporates the song by the same title, of course. My son had never heard it before so I made sure we sang and read it at the top of our voices when daddy wasn't home to hear mommy warble. Hmm, yes. In this particular rendition by author and illustrator Paul Brett Johnson, we meet Yodeler Jones, a dog with a diner whose business is floundering due to the fact that a new Fried Fritter Fricassee opened up right next door. Yodeler decides he needs to get serious about revamping his menu a little to reattract his customer base. While experimenting on a pasta dish he creates an amazing meatball which, of course, he loses to a sneeze. The song is interspersed throughout the book and it concludes by having the meatball land underneath a bush and turn to mush as a result of, well, an interesting baseball game. The meatball turns into a tree which produces meatballs and spaghetti sauce which, naturally, are all so spectacular that Yodeler's regular customers return and the competition goes out of business. All's well that end's well! Very cute book and this one was highly enjoyed. 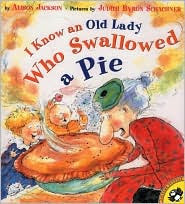 I was tipped off to I Know an Old Lady Who Swallowed a Pie during the last Children's Classics carnival at 5 Minutes for Books. Alicia at Experiencing Each Moment talked about a similar book, There Was an Old Lady Who Swallowed a Shell. Having recently read the original Fly version of the song, and having it met with much enthusiasm, I snatched up the Pie book having it on good authority that it would be a winner. No disappointments here. This old lady is doing her darnedest to swallow the entire Thanksgiving dinner. It's unfortunate that the original pie which started the whole problem for this woman was so dry. By the time she was done eating the pie, some cider, a roll, a squash, a salad, the turkey, a pot, a ten-layer cake, and some bread, she substitutes for a Macy's Day Parade float. Weight Watchers to the rescue!!! So the trip to the library wasn't so bad. The big question now is - will I get the books back on time?! I have the best of intentions! Anyway, back to the books--they both look great! 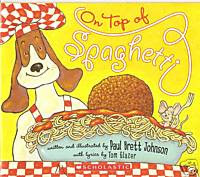 We've read the Pie book but we've never seen the spaghetti book. I like books that are made from songs, and so does my Louise, especially. I am so glad I am not the only one who can't get her library books back on time! So, how to you keep the book costs down? Do you buy most of your books online? Love your blog! Thanks for the info! I used to love reading books like these when my daughter was little. Now you've got me missing them.